Frequently Asked Questions How do I determine who to vote for? Each candidate will submit a statement about their experience and goals that will be published on this site throughout the voting window. When does the election process start? The election will launch Tuesday, April 23, 2019. When does the election end? The election will end Tuesday, May 7, 2019 at 11:59 PM Eastern. How do I get a ballot? If you are a voting member , you will receive an e-ballot via email. Who do I contact if I do not receive a ballot? Only voting members may vote and hold elected office in the association. Please email wmeyerhoeffer@amhca.org if you are a voting member and have not received a ballot. When will the results of the election be announced? The results will be announced in late October or early November. Who am I voting for and for how long? This year members will be voting for 3 three-year positions, President-Elect, Treasurer, and Director-at-Large. The term for these positions is July 1, 2019 through June 30, 2022. Esteemed Leaders! 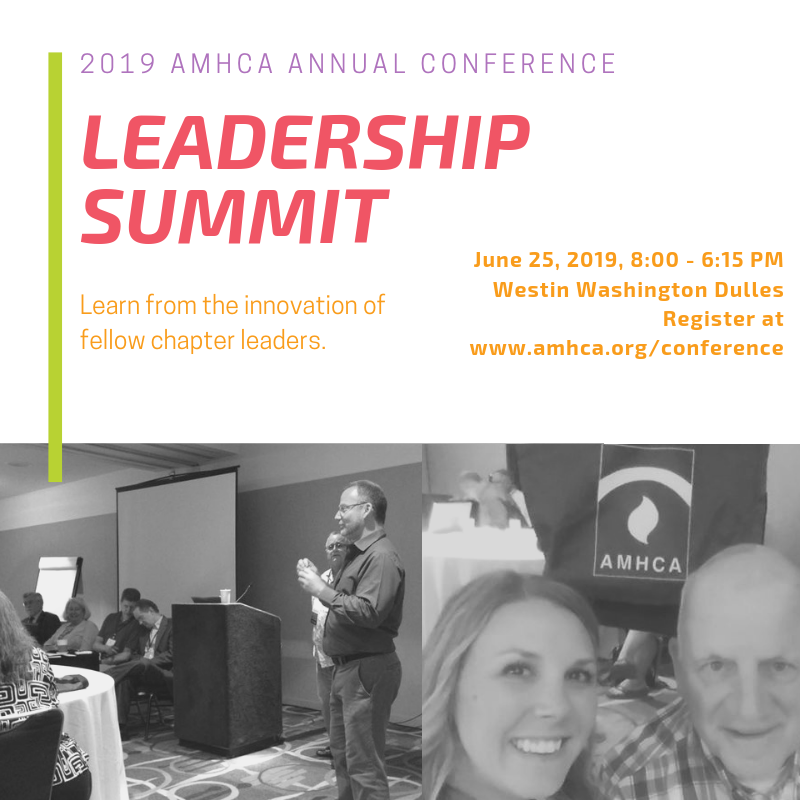 How excited are you for the 2019 AMHCA Leadership Summit? Leadership Summit The Leadership Summit proceedings will start on June 26th. We have listened to feedback and planned a day that will elevate interactive opportunities as well as collaboration on our shared priorities. We will have additional opportunities to join forces, learn from the innovation of our fellow chapter leaders, and roll up our sleeves and act. What will the day look like? Here is the full leadership schedule at a glance: 8:00 - 9:00 Breakfast and Registration 9:00 - 10:30 Welcome and State of the Association 10:30 - 11:00 Break 11:00 - 12:30 Ignite - State Chapter Innovation Spotlight 1:00 - 2:00 Lunch with Your Regional Directors 2:00 - 2:15 Break 2:15 - 3:45 Breakouts Content Track: Marketing and Membership Strategies Working Group Track: Enhancing State & National Legislative Advocacy 3:45 - 4:00 Break 4:00 - 5:30 Breakouts Content Track: The Nuts and Bolts of Association Leadership Working Group Track: The Future for One AMHCA - Reimagining the National, State, and Local Collaborations 5:30 - 5:45 Break 5:45 - 6:15 AMHCA National and State Chapter Advocacy in Real Time: Partners in Policymaking and Wrap-up 7:00 Welcome Reception As you can see, we will start the day altogether in the main room. We will take a deep dive into the state of the association as well as learn from each other as state leaders (that’s you!) 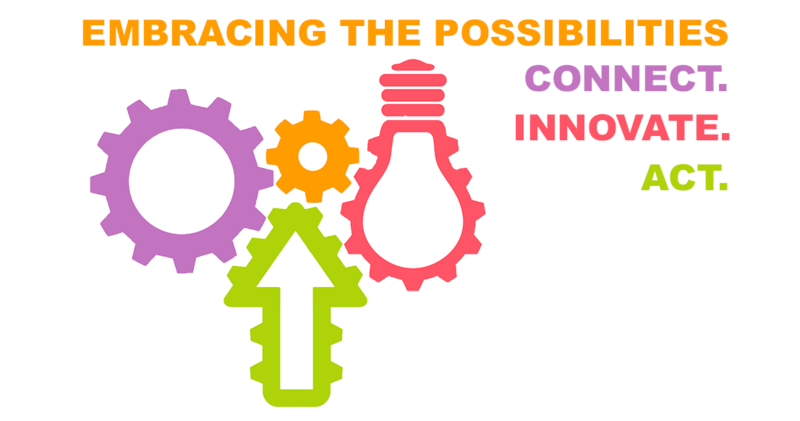 share how they are innovating in their home states. In preparation, please prepare to share a very brief (1-2 minute) highlight of something you do well in your state and prepare to take a deeper dive with interested attendees. It will probably be helpful to create a handout to share with attendees as well. In the afternoon, we will spend our time in smaller group breakouts. The breakouts will be organized into two tracks: (1) content track for folks that want to learn some basic skills to enhance their leadership and (2) working group track for folks that want to spend some time brainstorming, debating, and creating strategies for the future of the collective AMHCA. I hope this format will stimulate and challenge you as you lean into the challenges and benefits of leadership. Please consider your passion and where you would like to contribute. We hope to have as much representation as possible for all of these important topics! I hope our experience will enhance our ability to move forward as the only association exclusively working to advance the clinical mental health counseling profession.